The FFA P-16 was a Swiss prototype ground attack jet fighter designed in the 1950s by Flug- und Fahrzeugwerke Altenrhein to replace the piston-engined types then in service with the Swiss Air Force. The project was terminated in favour of the British-built Hawker Hunter before it was introduced into service. The P-16 was Switzerland's second attempt to develop a domestically-designed and manufactured jet fighter, after the EFW N-20. The P-16 was designed to be especially well-suited to the close-support role, and short-field performance was also emphasized. The resulting aircraft was a single-seat, single-engine design with intakes on the fuselage sides and a low wing. The horizontal stabilizer was mounted halfway up the fin. To ensure good performance from unprepared fields, heavy undercarriage and dual wheels and tires were fitted. The straight, low aspect ratio wing was of multi-spar construction with various high-lift devices including full-span Krueger flaps on the leading edge, large Fowler-type flaps on the inboard trailing edge, and ailerons which also operated as flaps. These devices allowed the aircraft to take off and land within 1,000 ft (330 m) at high altitude, allowing it to operate from the Alpine valleys characteristic of Switzerland. Two prototypes were ordered in 1952, the first one flying on 25 April 1955. Although this aircraft (J-3001) was destroyed in a crash on 25 April having made 22 flights with a total flight time of 12 h 38 min, a development contract for four pre-production aircraft was awarded. On 15 August 1956, the second prototype exceeded the sound barrier for the first time. It completed another 310 flights by March 1958 after which it was scrapped. The pre-production machines (designated Mk II) differed from the prototypes in a variety of ways, most importantly in using the more powerful Sapphire 7 engine in place of the prototype's Sapphire 6. Test flights proved promising, and a new contract was awarded in 1958 for 100 aircraft. 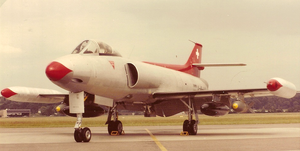 But when the first pre-production machine (J-3003) was destroyed in a crash on 25 March 1958 after 102 flights, the government cancelled the entire order and bought Hawker Hunters from the UK instead. FFA continued the program at its own expense for a while, completing two more aircraft to MK III standard, but was unable to attract buyers. These two aircraft (X-HB-VAC/J-3004 and X-HB-VAD/J-3005) first flew in July 1959 and March 1960 respectively. Their last flights were in April 1960 and June 1960. As of 2007, only a single example, assembled from parts of two of the prototypes, remains in existence. It is on display at the Swiss Air Force Museum at the Dübendorf Air Base. Certain design aspects of the P-16 were used by Bill Lear when developing the first of the highly successful Learjet family of business jets. Mk I: two prototypes powered with an Armstrong Siddeley Sapphire ASSa 6 engine of 7,900 lb (3983 kg) thrust. Mk II: pre-production machine with a Sapphire ASSa 7 engine of 11,0000 lb (4,990 kg) thrust. Only one aircraft was completed out of an order for four before the project was cancelled. Mk III: two of the unfinished Mk II aircraft were completed to MK III standard by FFA in an attempt to revive the project. These included armament of two Hispano-Suiza 825 30mm cannon and a Matra 1000 launcher for up to 44 68mm unguided rockets. P-16-Trainer: Training version with two seats in tandem for the Swiss Air Force. Without the two 30mm Guns of the Single seater version. ^ Georges Bridel, Verkehrshaus der Schweiz, Luzern 1975, ISBN 3 85954 902 2. ^ Georges Bridel: Schweizerische Strahlflugzeuge und Strahltriebwerke, Verkehrshaus der Schweiz, Luzern 1975 Seite 61, ISBN 3 85954 902 2. ^ John Fricker: AIR International März 1991, S. 145: Another development considered was a two-seat Training and operational derivative which could be easily achieved after removal of the fuselage guns, the cabin conditioning capacity being already there. ^ Fricker 1991, p. 146. ^ Fricker 1991, p. 144. Frickler, John. "Switzerland's P-16: Father of the Learjet." Air International, March 1991, Vol. 40, No. 3, pp. 139–146. Green, William and Gerald Pollinger.Die Flugzeuge der Welt (in German). Zürich, Switzerland: Werner Classen Verlag, 1960. Green, W. and Swanborough, G.; The complete book of fighters, Salamander (1994), ISBN 0-86101-643-2. Johnson, Robert Craig. "Swiss Guards: the Federal Aircraft Factory N-20 and the FFA P-16." Chandelle 2 (2), 1997. Schürmann, Roman. Helvetische Jäger. Dramen und Skandale am Militärhimmel(in German). Zürich: Rotpunktverlag, 2009. ISBN 978-3-85869-406-5. Strehler, Hanspeter. Das schweizer Düsenflugzeug P-16 (in German). Erschienen, Switzerland: 2004. ISBN 3-033-00051-7. Taylor, Michael J.H. Jane's Encyclopedia of Aviation. London: Studio Editions, 1989, pp. 39, 383. ISBN 0-517-10316-8. Wikimedia Commons has media related to P-16. "Swiss P-16 Jet For Short Runways." Popular Mechanics, April 1956, p. 136. This page was last edited on 11 December 2018, at 01:05 (UTC).